I am a huge supporter of using the passenger side approach on traffic stops. From the passenger side, I have seen drugs, guns, and other things that I would not have seen from the driver’s side. It is possible that the driver’s side approach has saved my bacon before. However, on Friday night, it saved me from being run over. It was just another “routine stop”: a minor traffic infraction that was going to garner the driver a written warning. I set up my patrol car with the normal offset to create the (fictional) lane of safety on the driver’s side. However, for a variety of reasons, I used a passenger side approach. During the course of my discussion with the driver, another driver sideswipes my patrol car and almost strikes the detained motorist’s vehicle. If I had been standing on the driver’s side of the stopped car, I would have been struck, and probably killed. The suspect vehicle was traveling at a high rate of speed, in the same direction I was pointed, so I did not see him prior to the impact. I did not have any warning (revving engine, squealing brakes, etc) prior to the impact. Had I been standing on the driver’s side, I never would have known I was in danger until after I had been hit. As it turns out, I was unharmed simply, and only, because I used the passenger side approach. Because I was not hurt, I am the center of a few jokes and new nicknames. If I had used the “standard” driver’s side approach, there wouldn’t be any joking going on at my department right now. So, if you don’t use the passenger side approach, try it out. It is not right for every traffic stop, but it is a very good alternative to the driver’s side approach. Even if you only use it on busy roadways, it can save your hide from passing traffic. While my wife could use the extra cash to pay off a few bills and get some landscaping done, I am glad she won’t be drawing my term life policy quite yet. 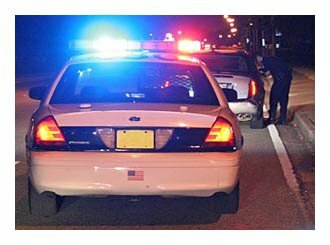 Make sure to take a look at Aaron’s in depth article on traffic stop safety here. He touches on passenger side approaches in addition to a wealth of other considerations when working traffic.